The Portland-Gorge-Spokane Tour was, as a Seattle band put it, Ultramega OK. It was by no means a bad tour. The scenery, while only consistently spectacular for the first two days and for moments after that, was good overall. The weather decent, only some rain on those first two days and then mostly sunny and warm for the rest. Besides the flat on day one there were no mechanical issues. And for a "first tour of the year", the lack of any true mountain passes was a good thing. But it was no means a "great" tour. I got to see some areas I had not seen before, namely the Palouse region of SE Washington. But two days of the Palouse was enough. There weren't a lot of "scenic highlights" when I got outside of the Columbia Gorge, so a lot of a day's riding has already blended together in my head. And the black cloud that settled over my head on Day Two and lingered through Day Three colored the trip. In the end things worked out, but I really don't know why the whole "What am I doing?" feeling came over me so sudden and so strong. During this span of twenty-four hours, I wondered if doing this tour was a good idea. I started to think about the tour I should be doing right now, whether it be a more intense exploration of the Columbia Plateau on the Oregon side, or biking around the Puget Sound after all. I started to doubt all my actions. "Well, maybe I should have stayed on the Oregon side and camped at Deschutes River State Park instead of Horsethief Lake. Maybe I should have gotten a crappy motel in The Dalles instead. Or shouldn't I be heading out to Minneapolis for Lake Pepin?" The six miles on a horrible gravel "shortcut" was icing on the cake. My mood didn't lift until I got to the free campground in Roosevelt at the end of Day Three. This was by no means the first time I had this feeling on a tour, and by no means will it be the last. But it veered dangerously close into the "scuttle trip" territory, and even after almost two weeks of it being over, I still don't understand why. I've ended tours early before, but I've only scuttled one: A tour from Minneapolis to Madison that I planned to take in October of 2009. I had even taken the train out to Minneapolis and started riding but ten miles in and after a flat tire I decided I wouldn't do it. The flat wasn't the entire cause of the scuttle, just simply the last straw. I had an uncertain situation back home, the forecast promised a trip full of bad weather, and the reason behind going to Madison (a zine show) never materialized. I had little inspiration to do the tour after all, besides doing the tour. If the first day started off good, I probably could have overcome the obstacles and put my head in the right place. But when the first flat happened even before I had left St. Paul, I knew I just didn't have it in me. While the Portland-Gorge-Spokane tour had an eerie parallel with a flat just ten miles in, it didn't have the same factors as the Minneapolis-Madison tour. Things back home were pretty certain, the weather would be a lot better than if I had stayed in Portland, and there were no other outside factors in deciding the tour besides just doing the tour. I think the uncertainty of the end of my trip fueled the black cloud. When I thought I had less time for the trip I was going to end in Pasco. But when I realized I had a couple extra days to play with I decided to shoot for Spokane as the endpoint. This had the effect of not just doubling the mileage, but routing me through an area with scant bike-touring information and few services. There were a few different routing options, but I had no clue as where I'd stay on Day Seven. In the end, I located a Warmshowers host in Pullman. This decided the routing, but ended up adding even more mileage than expected. This was a good choice, as I learned after riding through the region: there ain't nothing out there in the Palouse. Actually, it is a heavily cultivated region, but the towns are few and far between, and no campgrounds that I could find during my many internet searches. Theoretically I could have stealth camped, but besides some areas near rivers, there really wasn't any good options, as everything was farmland. Still, there were enjoyable moments throughout the trip. The most interesting thing was how certain areas reminded me of bike tours past. While the rolling farmed hills that made up the majority of the second half of the trip weren't the most scenic portions of my ride, they reminded me a lot of the rolling grassy hills in southern Alberta when April and I toured through there during our Cross-Country Tour in 2011. The only thing missing would be the epic Rockies in the background. These same hills and small towns would at other times remind me of riding through Saskatchewan. When I thought of these places, the Grand Filter Of Time made sure I remembered the good times, not the bad. If it didn't remind me of specific moments, it reminded me of the feeling of the time, the good feelings, sans the stress. In the end, this trip fulfilled a wish, an idea that had been brewing in my head for a few years. I finally rode the Columbia from Portland through the Gorge and where it turns northward at Wallula Gap. I had also finally rode between Portland and Spokane in one trip, and got to see the only corner of Washington State I had not been to at least once, the deepest part of SE Washington. Would I do this trip again? As a whole, no or at least not anytime soon. I'll be biking through the scenic areas of the Gorge again, of course. I'm sure I'll find an excuse to go back to Spokane and Walla Walla is good for a pass-through every 3-5 years. 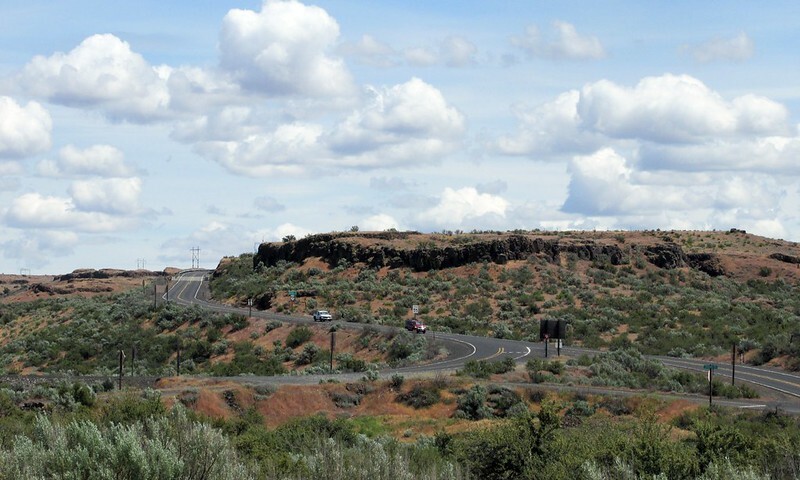 I still need to explore the Channelled Scablands region in Central Washington, an area I bypassed on this tour. But I doubt I'd go back to the Palouse. Once was enough. Hermiston and its surroundings had few charms, and biking the less scenic part of the Columbia Gorge was a bit monotonous. In the end, I'm glad I did this trip. I've stuck to my commitment of traveling through an unexplored area on all my trips. But I'll be a lot happier with the next tour and its mountain scenery. Man I know that feeling; I've probably had it at least a bit on most tours. On my cross country tour it hit me right around Libbey. Now I wasn't thinking of scratching the trip by any means, but sure was wondering what the hell I was doing. Anyway glad you surmounted it -- I've found that if I just keep riding I always am eventually won over. So I've never scotched a tour in progress but I did bail out on one the day I was suppose to set out. Looking through the set on Flickr I've gotta say you saw some great scenery. Obviously you selected the best so I believe you when you say the scenery declined (and I have been out in the Palouse myself, though not by bicycle). I gotta say that I really want to do a tour from the mouth of the Columbia and up the Gorge to some good point - maybe as far as your original plan here, Pasco. I've been to Stonehenge and the Dalles and various other bits out there but never made it as far as Walla Walla. About the last stretch of WA that I haven't been. Robert, yeah, the photos do make it look real good, right? If you notice, there isn't a heck of a lot of photos from Day 4. This is where the Columbia valley flattened out a bit. 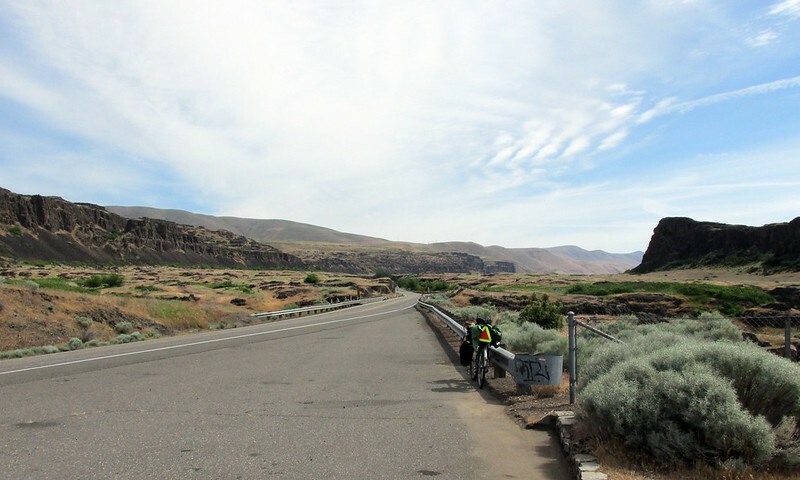 While it made for easy riding, it wasn't as scenic as the previous days or the next day when I'd go through Wallula Gap. And yeah, the Palouse was the scenic lowlight. Overall it was "nice", but it offered few scenic vistas and it was the same thing for most of the day. It was a big deal when I saw a hill in the distance. I'd love to try to take a tour further up the Columbia but roads don't follow it as much as they do from Pasco to the mouth. I do need to go through the Channelled Scablands, but the logistics are daunting. My host in Pullman recounted a tour he took from Pullman out towards the coast. The first three days was a whole lot of nothing, and at one point he ended up knocking at a stranger's house because he ran out of food! Something to note that I forgot to mention in the original post: On this tour I mostly followed Adventure Cycling's Lewis and Clark Route from Portland to just before Pomeroy. Say what you will about ACA routes, I do like riding them from time to time, and I also like trying out the ones close to Portland. Not just for the experience of experiencing the ACA routes in the Pacific NW, but it is helpful for work too, as I am the "bike touring person" at the hostel. So when people ask me "Lewis and Clark vs Trans-Am vs NT", I can give a qualified answer.